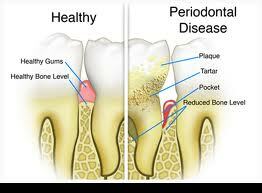 Periodontal Disease Treatment - Willow Grove PA - Kent Lane Mueller D.D.S. "Man​y of the more complex cases I treat restoratively, in my Willow Grove, PA practice, also require my treatment of this insidious and generally painless progressive malady. Although many cases may be treated in a conservative and relatively non-invasive manner, there are also those that require reflection and re-contouring of the infected gum tissues, remodeling and/or grafting of the tooth-supporting bone, and the careful removal of bacterial-infiltrated calculus (barnacle-like deposits) from the tooth roots by direct visualization under high-power microscopes. ​Bad breath, bleeding gum tissues, and mobile teeth are the early and late signs of this disease most noticeable by the patient. By treating the gum and bone tissues surrounding the teeth, the foundation of a healthy, long-lasting cosmetic and functional ‘complete dental makeover’ may be established."